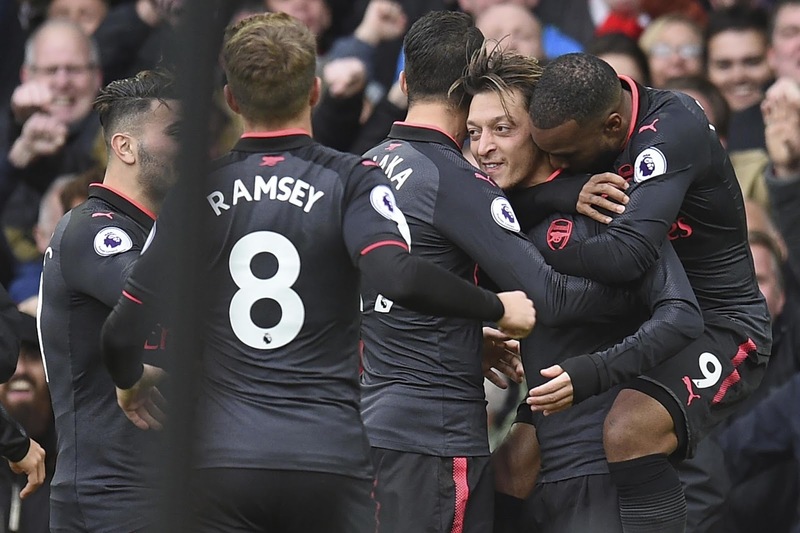 The 2-1 loss at Vicarage Road last weekend epitomizes the Gunners poor away form in the Premier League this season but a Mesut Ozil inspired Arsenal side returned to winning ways in style with a 5-2 demolition of Everton at the Goodison Park. Despite Arsenal’s early dominance, former Manchester United striker Wayne Rooney gave the hosts an early lead in the 12th minute with a fine right-footed effort from 20 yards after Xhaka was being dispossessed by Gueye. This in turn means that Wayne Rooney has now scored 12 Premier League goals against Arsenal; more than any other player has against the Gunners in the competition. However, in the 40th minute, Nacho Monreal restored parity for the visitors with a well-directed rebound before the end of the first-half. Meanwhile, a free header from Mesut Ozil in the 53rd minute gave the Gunners the lead after the playmaker connected well to a beautiful cross from Alexis Sanchez. In the 68th minute, Idrissa Gueye was sent off by Craig Pawson after receiving his second yellow card for a needless foul on Granit Xhaka. Goals from Alexandre Lacazette and Aaron Ramsey in the 74th and 90th minute respectively made it 4-1, but a lack of communication between Nacho Monreal and Petr Cech in the 93rd minute allowed Oumar Niasse pull one back for the host before Alexis Sanchez capped off the win with a brilliant goal in the 95th minute. Therefore, a win for the Gunners has lifted them up to fifth on the log while a defeat for the Toffees has dragged them down into the relegation zone on goal difference. Mesut Ozil has been heavily criticized for failing to turn up in big games so far this season but a man of the match display against the Toffees shows that when he plays well the team plays better. He made eight key passes in the game, which is double the entire Everton squad combined and four more than any of his own team-mates, and also put the Gunners ahead in the second half. Next up for the Gunners is a fourth round clash with championship side Norwich in the Carabao Cup in mid-week.